is the perfect choice. How should you get the data you need to estimate the bi’s? You may be tempted to design a test to estimate each of these factors by changing one factor at a time (OFAT). There are no interaction terms (e.g. b7X1X4) in equation 1. So there’s no need to perform any runs that change several of the X’s at once, right? Wrong. 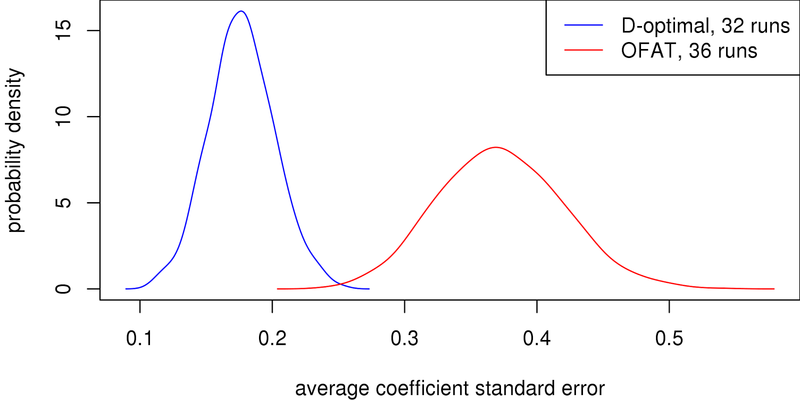 the average standard error in the coefficient estimates for the model in equation 1 are significantly lower for the D-optimal design most of the time even with fewer runs than the OFAT design. Why does this happen? Each run in the D-optimal design contributes to the estimate of every term in the model. However, each run in the OFAT design can only contribute to the estimate of a single term in the model. 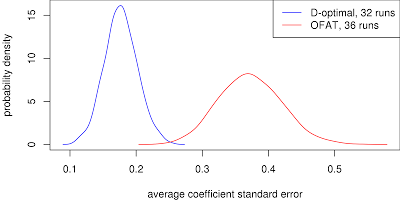 The “error bars” for OFAT designs will almost always be significantly larger than D-optimal designs (other optimality criteria give largely the same improvement over OFAT in practice). Hello VC, I am a bit confused by the topic of the post (and also I am not good with R). Basic question: in the table 1 shouldn't these be 0 and 1, not -1 and 1? It's common practice to center the factor levels so a two-level factor takes values -1 and 1. With the AlgDesign function gen.factorial used in the script above you can change this with the 'center' option (center=FALSE instead of center=TRUE). My goal with the post certainly wasn't to confuse, so please ask more questions if you've got them. Anything in particular that is especially confusing?